Photo: Batumi Raptor Count (Christian Gelpke). Abu Dhabi, 11 May 2014 - Today, the CMS Raptors MoU Coordinating Unit celebrates World Migratory Bird Day (WMBD) jointly with Bird Conservation Georgia, the leading nature conservation organization in the country, through its Batumi Raptor Count (BRC) programme located at the city of Batumi in Georgia. Since 2008, BRC has organised raptor-migration counts in the area, covering the full autumn season. Batumi is situated onthe Black Sea coast and is one of the most important migration bottleneck sites in the whole of the Western Palearctic region, due to the immense numbers of birds that use it. Last autumn, more than 1 million migratory birds were recorded passing through. Species using the Batumi bottleneck area are threatened by hunting. An analysis over three years has shown that almost 1% (c10,000) of the migrant raptors are being shot within the area. The two species suffering the highest shooting pressure are Steppe Buzzards (Buteo buteo vulpinus) and Honey Buzzards (Pernis apivorus). Both these migratory birds of prey are covered by the CMS Raptors MoU. Nick P. Williams, Programme Officer - Birds of Prey (Raptors) said, “This joint celebration, led by BRC and the Raptors MoU is a unique opportunity to demonstrate this year’s exciting WMBD theme – Migratory Birds and Tourism. We aim to show the local communities examples of the high concentrations of birds, particularly raptors, that pass through the Batumi bottleneck in Spring and Autumn every year. And to highlight and explain the real potential socio-economic benefits, particularly relating to eco-tourism, that can be harnessed by protecting these migrants and by maintaining a healthy eco-system in the region”. 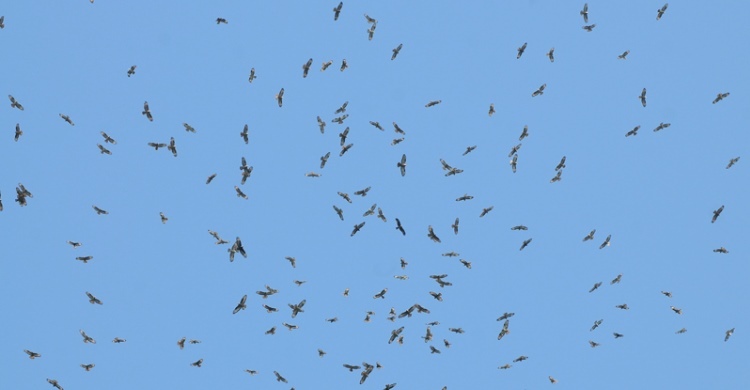 Batumi Raptor Count organizes counts every year to monitor raptor migration at the Batumi bottleneck. Anyone is welcome to experience eco-tourism with BRC, or by joining as a counter for short or long periods of time. There are 19 guesthouses situated in the bottleneck of Batumi from where you can directly witness the migration of raptors. The guesthouses are run by local families and serve delicous regional food. The program BRC offers a variety of local birding tours which can be optimal combined with the visit at the bottleneck. Find out more on the BRC website.